Following the World Health Organization (WHO)’s recommendation for exclusive breastfeeding until 6 months, my baby should be 6 months old before I can start looking for other signs of readiness. 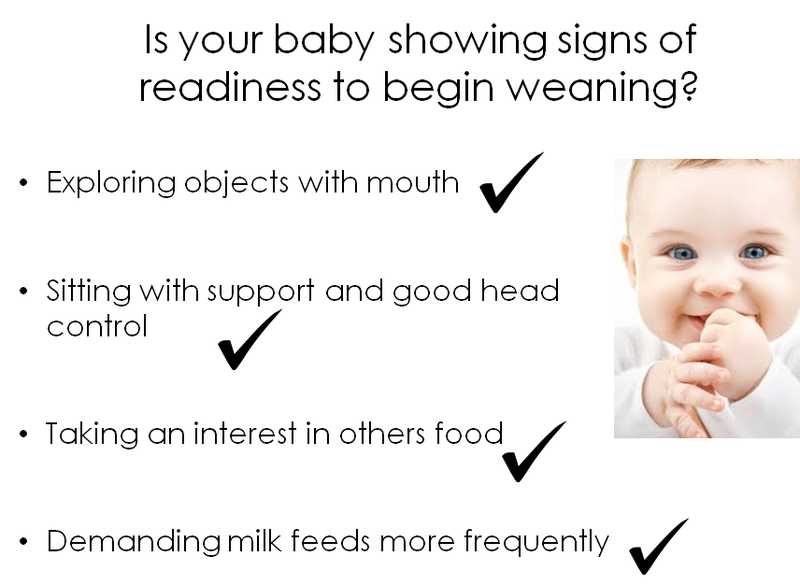 If my baby is starting to explore objects with his mouth and is sitting with support and good head control; starts taking an interest in others’ food and is demanding milk feeds more frequently then he is ready to start feeding on solids. Complementary feeding is an important step of my baby’s stages of life and plays a crucial role in determining the child’s eating patterns and habits when growing up. Seeking a dietitian’s help and advise before and during introduction of solids is key. My baby should be sitting with back support in a highchair or a booster seat. Mom, dad or caregiver, you need to face your baby while feeding. Pleasant and positive interaction should take place in order to allow him to enjoy his first interaction with food and allow him to set the pace and send you signals to follow his cues. No distractions should be allowed, the TV should be turned off, and your mobile phones should be set aside and silenced. Your baby needs to have your full attention, while discovering the new foods introduced. Have you heard of “Messy Play”? Parts of our positive feeding environment cues involve messy play. Mom, dad or caregiver, you should allow your baby to touch and play with the food they are about to feed on. A baby needs to get accustomed to the touch and the consistency of the meal that they are about to have. A safe way of going about it is using plastic sheets and covering the ground with newspaper to “contain” the mess. Using plastic feeding utensils such as spoon, plate or bowl as well as a tray is very helpful. Yes, it is messy to have to clean up the chaos; however, cleaning up a mess today, prevents you from having a picky eater tomorrow! Infants become familiar with and learn to like foods offered frequently. Learning to like foods can take time; parents or caregiver, you will need to keep offering foods the infant will be expected to eat as a toddler (i.e. home cooked meals). Infants enjoy being encouraged with praise and attention when they eat well but you shouldn’t spend ages persuading them to continue. You must never force them to finish the meal, feeding should stop when they signal they had enough. They usually keep their mouth shut, turn their head away or put their hand in front of their mouth. Older PostWhy do you offer Finger Foods for Babies between 6 and 12 months ?